OUR NEW WHITE SOFAS, WHY WE CHOSE THEM + FALL INSPO! OUR NEW WHITE SOFAS, WHY WE CHOSE THEM + SOME FALL INSPO! You may or may not know by now, that I have been wanting new white sofas, basically since we bought our grey ones that we’ve had since we built our home years ago. 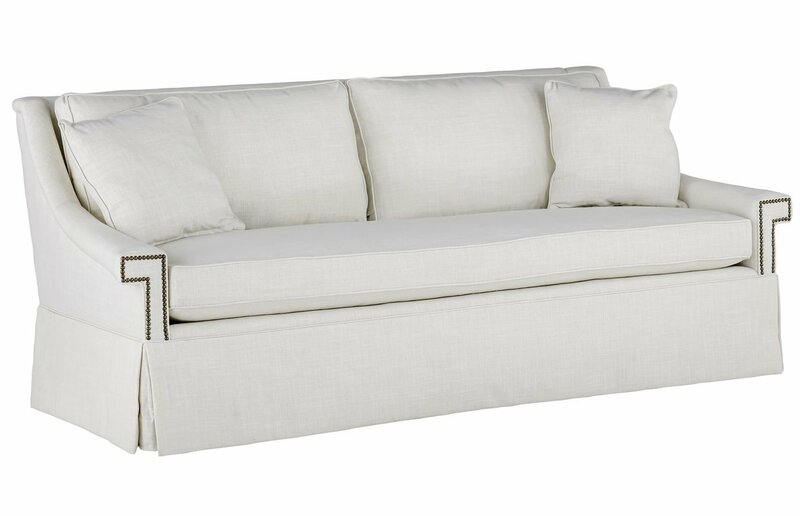 I wanted white sofas soooo badly, but I lost that argument because our kids were small, and we just didn’t want to deal with the messes that would come with them, or have to replace the furniture sooner than later. So, when we were furniture shopping for our home when we were building it, with no choice, I conceded, and went with our current dark grey ones (which I honestly do love, by the way). Fast forward eight plus years, and mama’s getting a new pair of sofas! Seriously though, I finally convinced my hubby that the time has come. Our kids are old enough now to be able to keep their hands clean (fingers crossed haha), and although we use our living room daily, all we have to do is throw down some blankets to protect them while we’re hanging out. Easy stuff. I think that’s a pretty decent compromise for fabulous new white sofas, wouldn’t you say?? Yes, my friends, I have loved our grey ones very much – they have celebrated eight Christmases, Thanksgivings and Easters, thirty-two birthdays, witnessed thirty-two seasons, they’ve watched every season of Game of Thrones, Fixer Upper, Property Brothers, sat through countless UFC fights, NHL Stanley Cup Championships and Super Bowls, the list goes on – however, it’s time for them to retire to the basement where the kids spend most of their time and we’re in dire need of something new anyway. Win win for for everyone ;) They arrive sometime in October, which kills me to have to wait so long, but they’re definitely worth waiting for! *Affiliate links are provided throughout, or at the bottom of this post for your shopping convenience – see my full disclosure policy here. Now let’s talk about my fall inspiration for a minute, before I get into the details about these new white sofas of ours. Navy and gold is a reoccurring theme around here, as many of you know already, and this fall it continues again. I’m thinking I might like to throw in a little burgundy here and there too. I am drooling over the beautiful ikat pillows in my design board that caught my eye, and I’m crossing my fingers that I’ll find something similar. 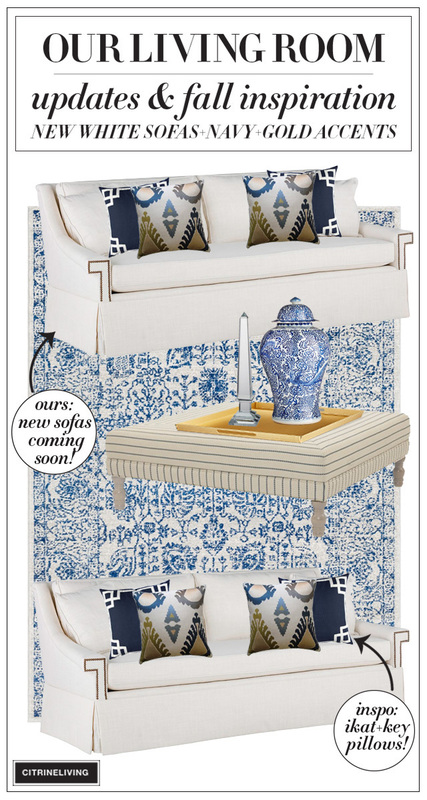 I really want to pair them with some greek key motif pillows as well, in navy and white, if I can find them. 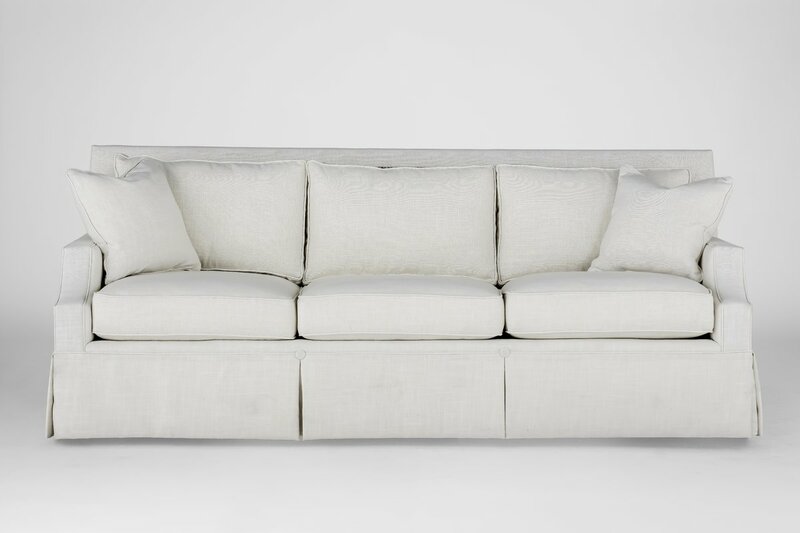 I often pile on the pillows on our sofas, but with these new white beauties, I’m thinking of keeping the look tailored crisp this fall. I just want to dress it up a little for a change. 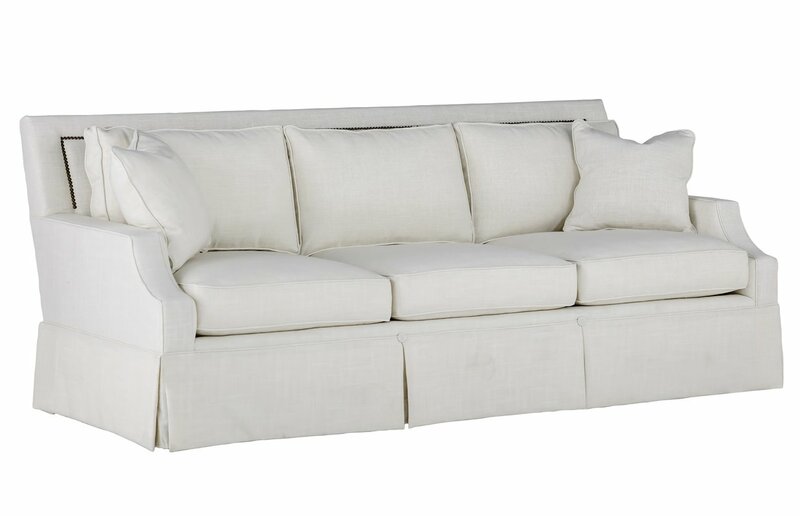 I could not love these new white sofas more – they have so many features that I am in love with. They’re elegant, sophisticated, and tailored. 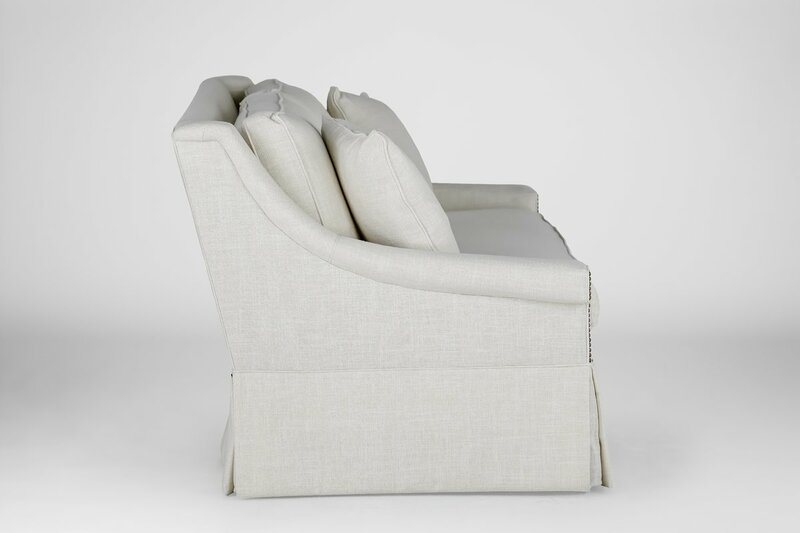 The greek key detail of the arm, accented with brass nailhead trim is so chic and although they have clean classic lines, the modern take is exactly what I was looking for. I’m excited about having a single cushion versus the three cushions our current sofas have. I am a little concerned about how it will wear over time, only because I don’t want one spot to get worn in, but rotating it regularly should do the trick. The skirt is another detail I LOVE. It’s a little more traditional, but also a little more grown up and will be a nice change for this room. 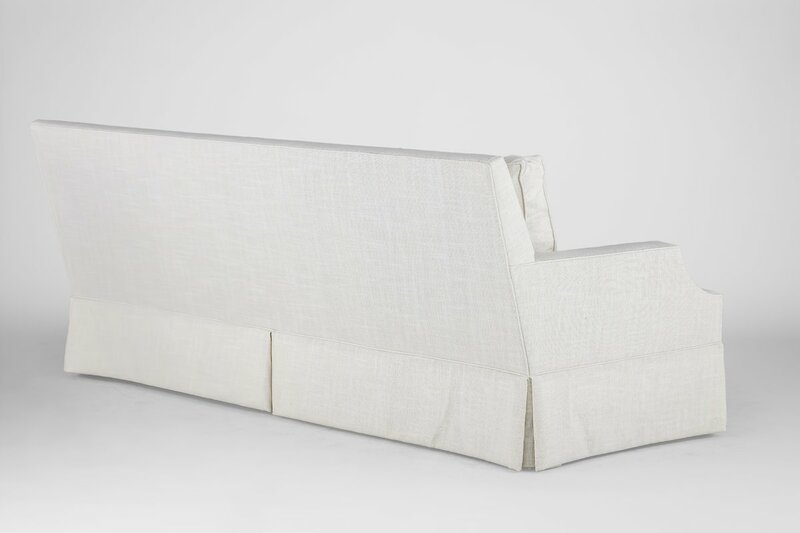 The side profile of these new white sofas is gorgeous, and I love the soft gentle curve of the arm. It gives a more relaxed feel and adds a casual elegance that I always love. It also helps keep the lines from looking too formal or stuffy. 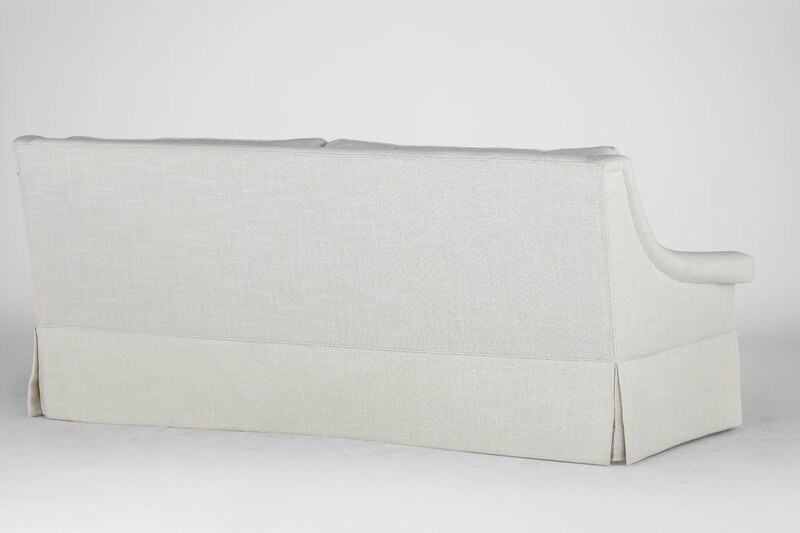 The back is clean and elegant and tailored as well, and we plan to have these sprayed for stain-resistant protection when they arrive. October cannot come soon enough! These new white sofas will change our space drastically and I’m excited to see the transformation! Next on the list will be new fabric to recover our ottoman again. 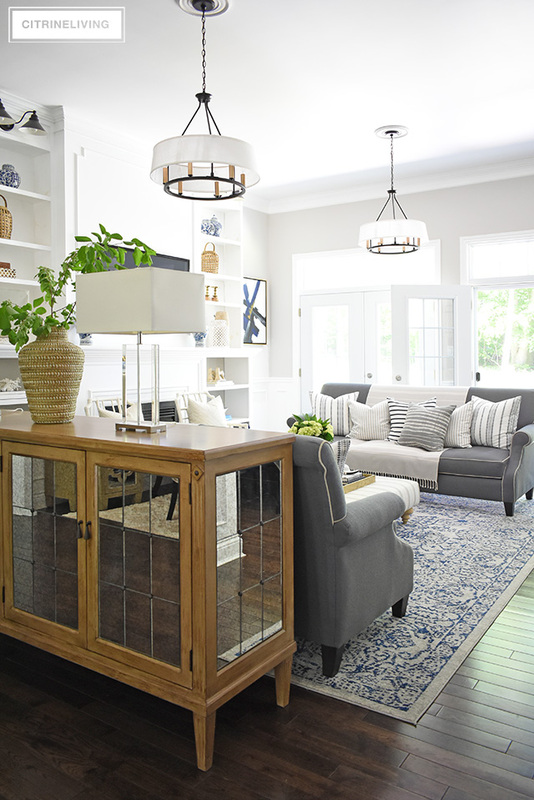 I’ve changed this piece several times – see one of our previous looks here from a few years back, and last year’s Spring Home Tour, here – I’m thinking of a simple cream and navy stripe to keep it clean and neutral. I was on the fence between this sofa, Paige, and the one we chose in the end, Jaclyn. I love the classic, timeless look of this one and I was convinced it would stand the test of time and last for years. 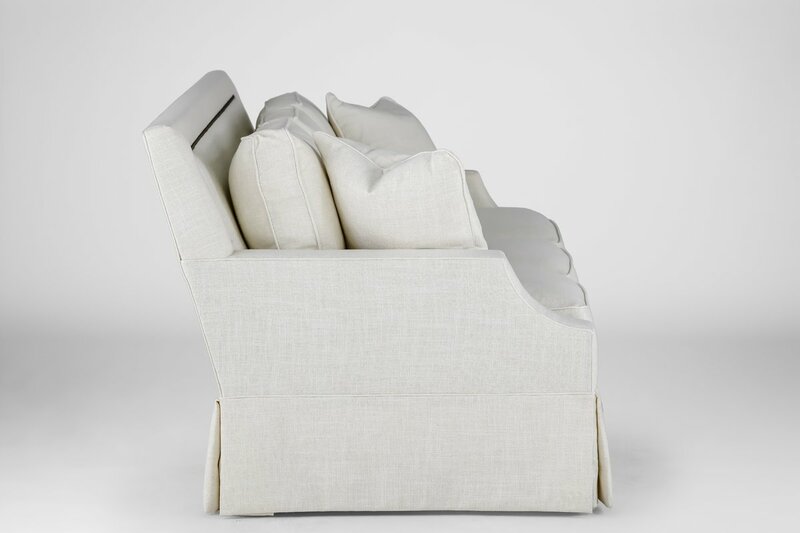 But what won me over in the end, was that the Jaclyn was a little different, with the arm details and single cushion, and had a bit more of that modern edge that I was looking for…a little more glam without being over the top. Below is a peek at what they’re going to look like – it’s just a mockup, but pretty convincing at a glance! I added them in Photoshop to one of my summer images to get an idea of how they’ll look. The scale is a little bit off actually, because they are not as tall as our current sofas. I had to make them as large in this image so we don’t see the grey ones behind them. In reality, they are a little bit shorter than the buffet that holds our lamps, so we are going to have to rig something up to make the two pieces work together. I don’t want it to overpower the sofa if we leave it as is, and it would just not look right if so much of it was showing above the sofa. This shot from my summer living room (see more of it here), gives you an idea of the scale of our buffet – the top of our new white sofas will come up just about to where the bottom of that top curve ends – so they’re a good four inches shorter…l think we’re going to start by removing the legs of the buffet and see how it looks sitting on the ground. I’m completely ok with that, it’s not uncommon for a buffet to have no legs! If I don’t like it, we may try and cut them down, which my hubby really doesn’t want to do. So, we have some work ahead of us and decisions to make, but I’m not worried, I know we’ll make it work either way. « WEEKEND FAVORITES: THE NORDSTROM ANNIVERSARY SALE ENDS TOMORROW! 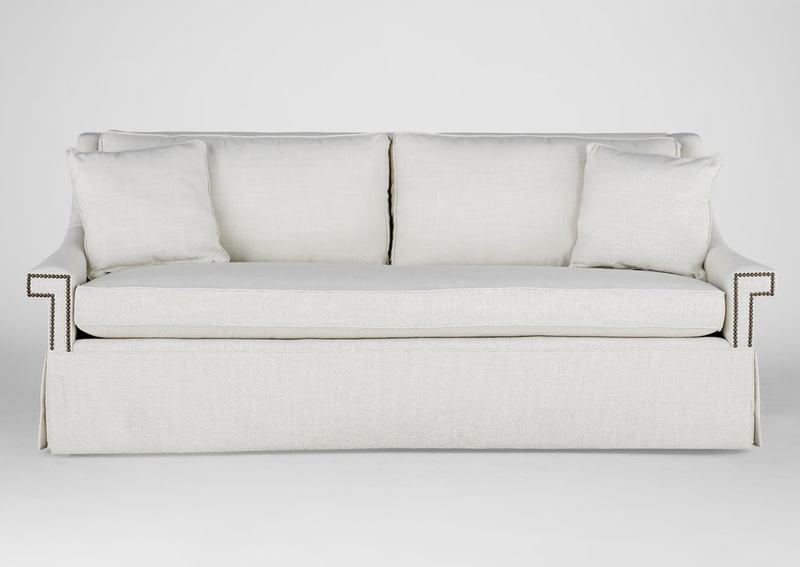 12 Comments on OUR NEW WHITE SOFAS, WHY WE CHOSE THEM + SOME FALL INSPO! Gorgeous, I love them. Such a pretty silhouette to them. Absolutely stunning! I can’t wait to hear how you plan to maintain them. Thank you so much!! We’re definitely going to have them treated and I will cover them with throws that’s for sure!! Hope I can upkeep them!! Where is the art work from? Thank you very much!! I am so happy you like them! I’m very excited for them to get here! They are going to be fabulous!!!! I love love love them!!!! Thank you so much, we received them and LOVE them! I’ll be revealing our living room updates very soon! The fabric I chose is the one in the photo – Zulu Vanilla, it’s gorgeous!